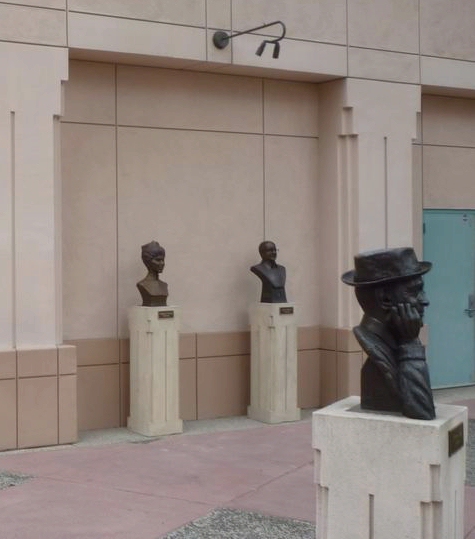 The Academy of Television Arts & Sciences Hall of Fame was instituted in 1984, and its sculpture garden at TV Hall of Fame Plaza was created in 1991. 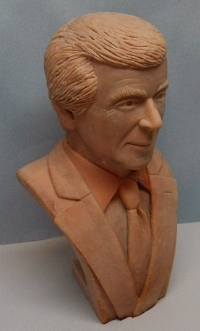 It now includes bronze busts and statues, base-reliefs, and wall sculptures of greats of the small screen. 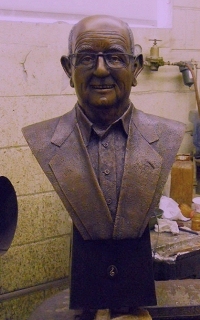 Randy Groves' contribution to the outdoor exhibit includes a bronze bust of conductor, film scorer and musician Earle Hagen and one currently in progress of ABC News anchorman Peter Jennings. Getting there: The Hall of Fame is located in the outdoor Academy Plaza, in front of the new Academy of Television Arts & Sciences building in North Hollywood (about two miles northwest of Universal Studios), near the northeast corner of Lankershim & Magnolia Blvds. The Academy building is tucked away in a larger center behind (north of) the Landmark Entertainment Group Building, on the east side of Lankershim Blvd. / From Hollywood, take the Hollywood (101) Freeway into the Valley and get off at the Magnolia Boulevard exit. Go east on Magnolia (half a mile) to Lankershim Blvd. Turn left (northwest) on Lankershim, then turn into the private drive that leads into the center. Once inside, you'll quickly spot the giant Emmy Award fountain. The busts and statues that make up the Hall of Fame surround this fountain.